Advanced security for your Internet connection when passing through our highly secure, encrypted VPN tunnel. 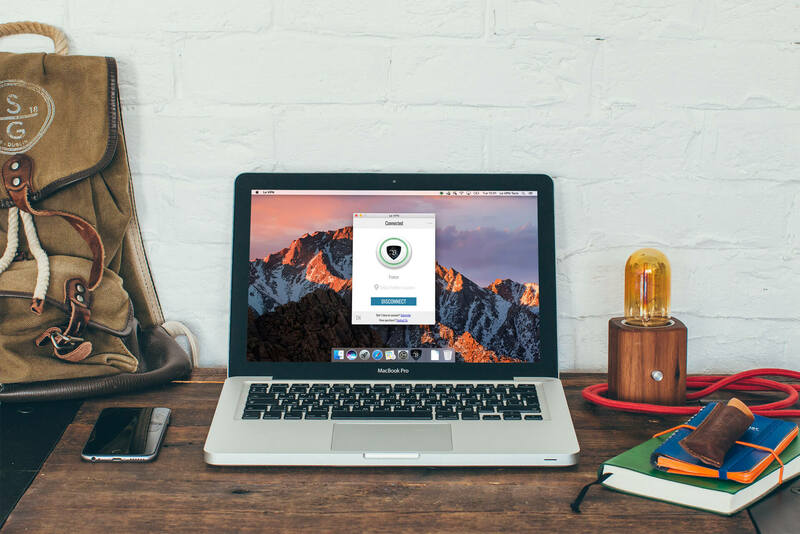 The best VPN software for Windows: quick installation, intuitive and easy to use. Compatibility with Windows 10, 8, 7, Vista, and XP. Fast one-tap connect and VPN server selection in 114 countries. Stable VPN connection for highly restricted networks, thanks to different VPN protocols in the same app: OpenVPN UDP 53, TCP 80, TCP 443; plus L2TP/IPSec. Automatic protocol and port selection: OpenVPN UDP 53 by default, then an automatic connection to other ports and protocols if one is unavailable in your location. Killswitch function: blocking Internet connection while reconnecting. Automatic connection on Windows startup for maximum privacy and security. HybridVPN DNS function for privileged streaming in the US, UK, and France with zero speed loss. Safe P2P, torrent download and file-sharing through dedicated servers in Europe and North America. Connecting securely to an unfamiliar Wi-Fi network. Risk and uncertainty are inherent whenever you connect to the Internet over a coffee shop, hotel or another unfamiliar Wi-Fi hotspot. Ultimately, you never know who could be monitoring your Internet use unless you use a VPN software. VPNs encrypt your online activity, making it impossible for hackers or other malicious users to spy on you. Keeping your Internet use private. A VPN also disguises your IP address. This makes it impossible for your ISP to keep records of your browsing or search history, or read your emails. In an age of increased government surveillance, this gives you additional peace of mind knowing you won’t accidentally incriminate yourself when surfing the web. A VPN can allow you to bypass geographically restricted firewalls. Use it to access censored websites and social media platforms, and get the latest news from home when traveling abroad. Whether you’re staying in touch with family or conducting important business over Skype, WhatsApp, Viber or Telegram, a VPN helps keep your private conversations private or simply lets you use these voice and messaging apps in the countries where they are not available. Torrenting or sharing files over a P2P network. Torrents and peer-to-peer networks are two of the fastest ways to send large amounts of data privately. For this reason, they are commonly used to transmit confidential files. If you have to transmit sensitive intellectual property or privileged information, a VPN provides additional encryption and security. 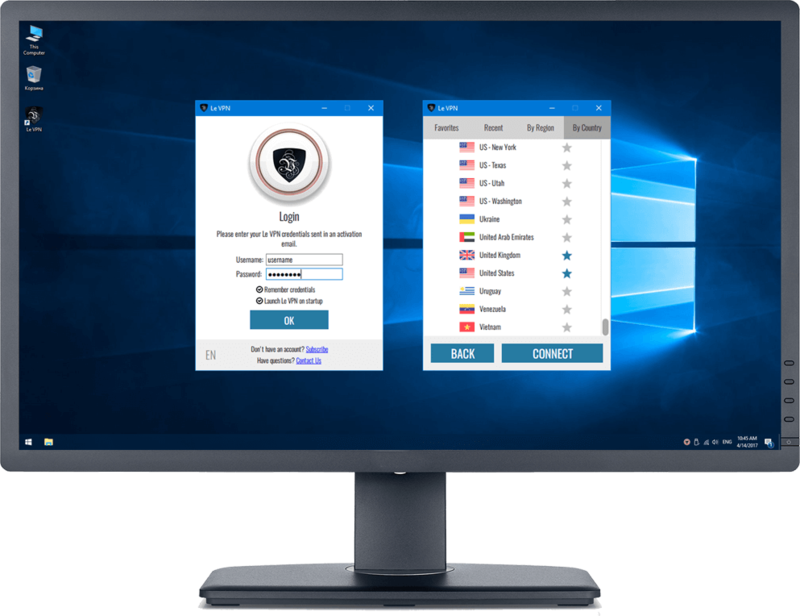 This is one of the many reasons Le VPN’s Windows VPN software is commonly used by lawyers, government contractors and other on-the-go professionals. Install Le VPN software on your computer. Click “Connect” on the red Le VPN button which will become green when connected. Feel free to change your new IP location from the default to the country of your choice. Visit our Windows setup page for step-by-step instructions and a link to download the right software for your system. Want to install Le VPN on Windows phone? Windows phone VPN installation instructions are here. If you’re not already a Le VPN customer, signing up only takes a few minutes. Plans are all-inclusive and start at just $4.95 month with a one-year commitment. One-month plans are also available, plus a 7-day Moneyback guarantee gives you a free VPN for a week if you decide not to proceed with a plan. Subscribe today to begin enjoying unlimited high-speed access to our worldwide network of more than 800 servers and IP addresses in 114 countries.